The Muslims Against Crusades group tells Channel 4 News that a protest to disrupt the Royal Wedding “will definitely go ahead” despite a ban on them demonstrating outside Westminster Abbey. 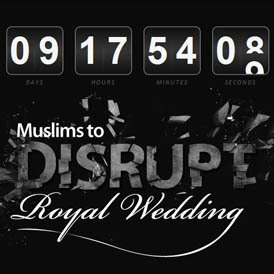 An extreme Muslim action group has vowed to disrupt the Royal Wedding on 29 April in protest at continued military action in Muslim countries. The Metropolitan Police told reporters that the Muslims Against Crusades (MAC) Group, along with the English Defence League (EDL), had made requests to lead protests outside Westminster Abbey on the day of the wedding, and that both of those requests have been rejected. He said the protests are to highlight the Royal Family’s “tacit support of the war in Afghanistan”. On the MAC website a countdown clock ticks down to the date alongside images of Prince William smiling, superimposed over images of injured Muslim children. Prince Harry is portrayed as a “Nazi sympathiser” and Prince William as “one of the biggest advocates of British Imperialism” whilst the Queen is labelled a “very brutal dictator”. The request to protest at the Abbey was rejected by the Metropolitan Police, who have the power to do so along the main route of the wedding party back to Buckingham Palace, under the Serious Organised Crime Act of 2005. They are currently in discussion with MAC and EDL about how and where other protests may take place. Despite the refusal of their protest application, Muslims Against Crusades’ media spokesman Anjem Choudary indicated that they would still use the wedding as an opportunity for the Muslim group to raise their profile. The EDL declared on its Facebook page that it “will not be counter-protesting at the Royal Wedding against the Muslims Against Crusade” but did insist that they would be monitoring the movements of MAC members closely in a response that could threaten clashes on the day. In an official press release the EDL said: “The EDL will however be celebrating the Royal Wedding as general members of the public, not in EDL colours, and 50-100 members will be at every Tube Station to ensure that MAC do not enter the streets of London to disrupt the Royal Wedding. The two groups have clashed before, in 2010 outside the US Embassy on the anniversary of September 11 and earlier this month as part of the MAC protest against US Pastor Terry Jones‘s burning of the Koran. The latter protest saw 80-100 MAC members marching from Regents Park to the American Embassy, coming into contact with pockets of EDL members along the way, notably at one point on Oxford Street. On 11 November 2010, Muslims Against Crusades conducted a protest against British armed forces outside of the Albert Hall where members chanted “British soldiers burn in hell” during the two-minute silence and one protester, Emdadur Choudhury who was later fined £50 for his actions, burned a number of poppies on the anniversary of Armistice Day. Five-thousand police officers will be deployed on 29 April to control crowds that are expected to amount hundreds of thousands trying to get a glimpse of the wedding party. Sixty people known to the police from previous demonstrations will be banned from Westminster on the day and the Met will be using “spotters” to identify what they term as the “black bloc” of anarchists they fear will try and cause trouble. Owens said there was so far no sign of a terrorist threat declaring: “What we are hoping for for the Royal Wedding is a fantastic day of ceremony and pageantry.” However, the Assistant Commissioner admitted that they were “not naive” of the social media “chatter” that promised more unauthorised action on the day.